It's a cold and rainy day here in Montreal, but that hasn't stopped a slew of bands from making plans to visit the city this weekend. 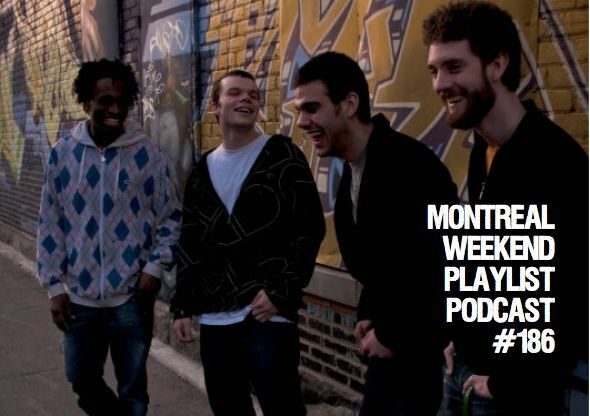 There's also M pour MontrÃ©al, an 80th anniversary for the Lion D'Or, and the 40th anniversary gala for Head & HandsWe could have filled two podcasts with the amount of songs we had submitted this week. Luckily you, dear readers, are the benefactors of this musical overload. Amie, Greg and Jer cram 16 songs into just over an hour for your listening pleasure. photo of ruckus fo'tet having a grand ol' laugh before their show tomorrow night from their website. You guys and brownies, hilarious! Don't have a recipe, not their biggest fan. Still love the show though. Thanks Katie! You're welcome to leave us a recipe for anything you want - doesn't have to be brownies. Preferably something sweet. Whatever you wanna hear us tasting on the podcast. Talk about interactive, right? Breaking down the fourth wall? Fifth wall? Tenth wall? I've lost track. Ooooohh... Greg, greg, greg... dude you don't know.. Pearl Jam is THE greatest band of all time EVER. Period. Totally under-rated. They showed me how good rock music could be. :) Have you ever heard the song Footsteps (most recently released on the Lost Dogs compilation) ? Pure gorgeous torture..
Great show and I won't post this 17 times by mistake again. sounds like a midnight brownie podcast! this small restaurant near my house makes these luscious blondies that i always swear never to eat again but end up craving much too often. i prefer blondies to brownies just because my body cannot handle as much chocolate as it wants (woe is me! ), but greg sounds like an impressive baker. p.s. unlike eating too many brownies, listening to your podcast gets better each time. Sweeeeet, thanks for the blondie recipe maybelately. I'm definitely making it this week. As for Pearl Jam... my relationship with this is largely tempered by the fact that my mom blocked me from buying Ten when I was in elementary school because she wanted to project me from the dangers of rock music for a couple more years. Siamese Dream became my first major rock record and I subsequently became a Smashing Pumpkins devotee and a longer term shoegaze/prog/fuzz-rock fan. So who knows how different my musical tastes would be today if Ten had taken the place of that album. As it stands, I never got too into Pearl Jam, and never fully understood what they stir up in people. I do respect them, just don't "get" them. I'll check out the song you suggested, though. Maybe that will win me over.